I think that’s the wrong way to think about networking. Networking is really about building relationships. As with all relationships, I have close ties to some people in my networks and less close ties with others. But I don’t think of the people in my networks simply as people who can help me. I think of them as interesting people I like knowing. And I don’t think of the relationship as a one-way street: they are as likely to ask me for a favor as I am to ask them. In fact, I may never need a favor from many of the folks in my network, but that doesn’t mean I don’t think it’s worth maintaining a relationship with them. If you wait until you need to search for a job to build your networks, you are way behind. Building your networks is something you should do as a matter of routine. Build and maintain a broad range of professional and personal contacts throughout your life, and that network will not only serve you well in job hunting but in a lot of other capacities. Some members of my professional networks have become personal friends. Others have given me valuable information or advice about both personal and professional projects. They’ve recommended doctors, accountants, and other professionals. They’ve helped me with the work I’ve done for non-profit boards. I learned the value of networking relatively late in my career. Like a lot of people who lean introverted, I didn’t like glad-handing strangers at cocktail parties, and that’s how I thought of networking for a long time. I was in my early thirties when I moved to the small town of Spartanburg, South Carolina where I quickly learned that the old adage “It’s who you know” was gospel truth. Getting anything done was a lot easier if you knew people. I ran into many of the same people over and over, and I found that they were adept at helping each other out. I learned to pay attention to who I was meeting in many areas of my life, to say hello to them when I ran into them again, and to find little ways to stay in touch over time. In short, I built relationships with people. Not all of them became close friends, but many of them were people I could reach out to when I had a student who wanted to intern in their fields or I was working on a non-profit board that need to make a valuable connection. I also think of networking as a pay-it-forward enterprise. I often introduce people in my network to other people in my network I think they should know. Maybe they’re both young single professional women in my small town. They may hit it off and become friends or they may just be nodding acquaintances, but it’s still good for them to know each other. Often when a student was taking a job in a distant city, I introduced her to other former students who were already living there who could help them with the process of settling in and learning the lay of the land. I often introduced historians to other historians researching similar topics. When I talk to clients about how they are building networks, they often say, “I’m connecting with people on LinkedIn.” Don’t get me wrong: LinkedIn is a valuable tool, and it can sometimes be a good way to make new professional connections, but connecting with people on LinkedIn is a very weak form of networking. Ilana Gershon, an anthropologist at Indiana University and the author of Down and Out in the New Economy: How People Find (or Don’t Find) Work Today, did a major study of what works in the job-hunting process these days and found that only 17 percent of people getting jobs did it through weak ties like LinkedIn while 61 percent did it through workplace ties. By workplace ties, she means people who have had the opportunity to see you in action professionally and can speak firsthand about your abilities and accomplishments. Someone that you know only through LinkedIn can’t do that. What’s more, because they have no personal relationship with you, they have very little incentive to help you out. Most of the people in your networks aren’t the folks you meet at chamber of commerce receptions or professional meet-ups, but people you have actually worked with. They’re the colleagues in your organization, people who used to work in your organization and have moved on, vendors and contractors and clients. They’re the colleague on a non-profit board or the person who sat at your table at a professional association meeting. They have a relationship with you, and they often want to help you out because they like you and respect your work. 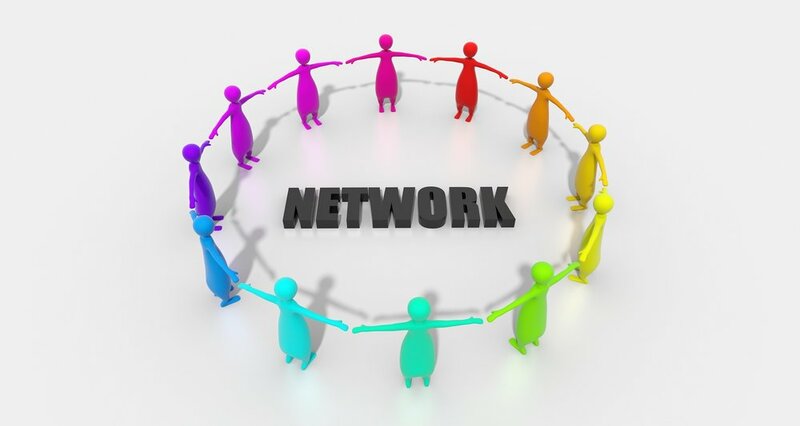 1) Everybody should network: college students, stay-at-home moms and dads, retirees, and of course, professionals. 2) Be intentional about building networks. Make it a point to remember the people you work with in many capacities and the people you meet along the way. When you meet someone interesting, give them your business card and suggest that you meet up again for coffee or lunch. Invite them to another event that might interest them. 3) Likewise, be intentional about maintaining relationships with professional contacts throughout your life. Staying in touch with them can be as simple as reaching out to say “hi” via email or Facebook once a year, sending them a link to an article that might interest them, or connecting them with someone you think they should know. 4) Don’t think of the networking relationship as a “just wanting something from someone.” You’ll help some folks and some folks will help you, and sometimes you’ll just know another interesting person. 5) Help other people build their networks. Introduce them to people they might like knowing. Do you have networking strategies to share? Let me know in the comments. Did you enjoy this blob post. Sign up to receive my Heyday Coaching newsletter with news and insights you can use, including new installments of this blog. Thank you for signing up! Watch for the Heyday newsletter on the 2nd and 4th Mondays of the month.